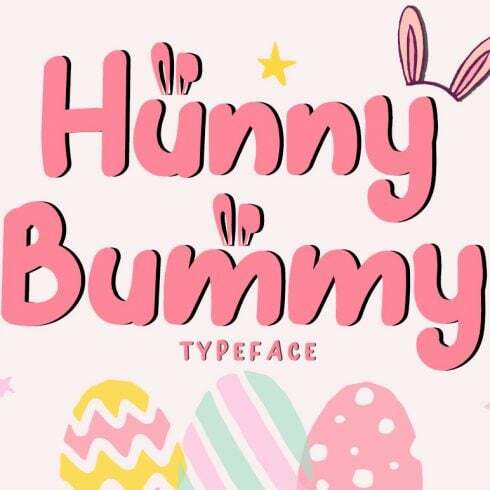 Hunny Bummy Typeface is a cute handwritten typeface, comes in a regular style and alternated with bunny ears. This collection will looks great for your holiday seasons design. Suitable for posters, merchandises, kids stuffs, quotes, advertisements, printing or cutting projects, and many more. Just pair each style to make your design more beautiful! Thanks for checking this out and happy designing ! Font is a graphic representation of textual content. It might often be identified as a design pattern for a collection of characters. With various patterns, point sizes, font weight, and shade, fonts set the appearance of design. The prices on a single font vary from about $7 to $100 depending on the vendor and marketplace. The standard of typography can help determine the way in which visitors see and grasp written information. Fonts make it possible to capture attention and determine structure. They set the mood and develop brand recognition. Advertisers are aware that fonts can create or break just about any graphic ad, business logo, or brand design. Whenever you uses poor or commonly used fonts, customers consider the design and style as cheap and do not respond. In the event the font is unreadable, the whole original endeavor fails to achieve its aims. – Sans-serif – the characters without dashes at the ends, which offers a more contemporary, “minimalistic” style and makes easier the comprehension of large text pieces. – Script – lovely cursive or handwritten fonts where letters tend to be crossed with one another. Script is ideal for creating a sophisticated, interesting and relaxed handwritten textual content. – Decorative fonts – designed primarily for catching the audience’s attention or employed for another specific effect or goal. A web font package is simply a set of various two to fifteen fonts available at more affordable price. The best part of buying units is that they cost you just a little bit more than one single web font does, provided they are on sale. The regular price of a web font package on our website is just two to twenty dollars. However, hurry up: the life cycle of each bundle lasts less than 5 days. The standard of typography can determine the way in which buyers see and grasp content. Fonts make it possible to grab curiosity and determine structure. Fonts set the mood and produce brand recognition. Entrepreneurs know that fonts can create or destroy just about any visual advert, business logo, or brand visuals. When the designer uses poor or plain looking fonts, users consider the design and style as low quality and don’t keep reading. When the font is unreadable, your entire artistic project does not work out to accomplish its goals. I Haven’t Discovered Any Desirable Fonts within This Particular Bundle. ? Do not worry! MasterBundles features lots of different bundle choices for numerous occasions and designs. Just look through our website and you’ll undoubtedly discover something to your taste and expectations. Masterbundles is an internet marketplace. On our resource, professional web designers sell their creations at the best prices. We provide you with the very best deals on the market, and our products are highly reviewed by clients. Go and visit our blog, it is packed with useful content for professional designers. Additionally, if you subscribe to our newsletter, you will be the first to find out about our special discounts. There will always be discount codes and promotional codes offered to chop the prices to a minimum.